The city of Boston does a pretty good job managing its energy use -- in fact, it was just named the most efficient large U.S. city in the American Council for an Energy-Efficient Economy's 2013 City Energy Efficiency Scorecard. But there’s always more to be done -- and figuring out what investments will yield the greatest efficiency returns for an enterprise as complicated as a modern city is a challenge in and of itself. We’re talking about everything from weighing the relative benefits of various energy and carbon footprint reduction projects across a city’s building portfolio and vehicle fleets, to calculating just how water, waste and resource use can be optimized at the right cost. These are the kinds of challenges that “smart city” technology vendors are trying to address. This week, one would-be contender, Schneider Electric, announced its biggest smart city project yet with the city of Boston, one that aims to capture and analyze data from the city’s 350 facilities, 850 traffic lights, 64,000 street lights and 3,100 city vehicles to help it meet its efficiency and environmental goals. Schneider, which first announced its smart city aspirations last year, has combined a number of its business lines around this practice, he said. Those include its supply and sustainability division, which grew out of Schneider’s $268 million acquisition of Summit Energy, where Wilhite was CEO. It also incorporates the smart grid and predictive analytics technology it has incorporated from its $2 billion purchase of Telvent. Since then, the French company has made strides in the still-nascent field, taking third place in Navigant Research’s recent ranking of smart city technology suppliers, right behind long-time market players IBM and Cisco, and ahead of other smart-grid-to-smart-city contenders such as Siemens, Hitachi, Toshiba and General Electric. Boston is using two of Schneider’s StruxureWare web-based offerings: the Energy Operations platform, which collects and analyzes building management systems and interval energy data, and its Resource Advisor, which combines this building energy data, along with sustainability and resource planning tools, into an enterprise view. Brian Swett, Boston’s chief of environment and energy, said in a Monday interview that the city has to date “been largely focused on rolling out building management systems to give us control of energy, and to some degree visibility of energy, at the building level.” That’s a big undertaking in and of itself, involving building-by-building technology covering some 16 million square feet of city-owned real estate. But “this is the first time we’ve taken that to an enterprise level,” he said, “with analytical tools to help identify where we can make cost-effective energy efficiency investments.” That will start with individual EnergyStar ratings for all city buildings, along with analysis to identify which buildings, or energy-using systems across buildings, are best suited for investments to improve their performance. Boston will also run a pilot project at five different types of buildings (a police station, a firehouse, a school, a library and a city office building) with an eye toward identifying patterns of energy waste and savings that can be applied to other buildings of that type, he said. Visibility is also a key goal of the project, Swett added. 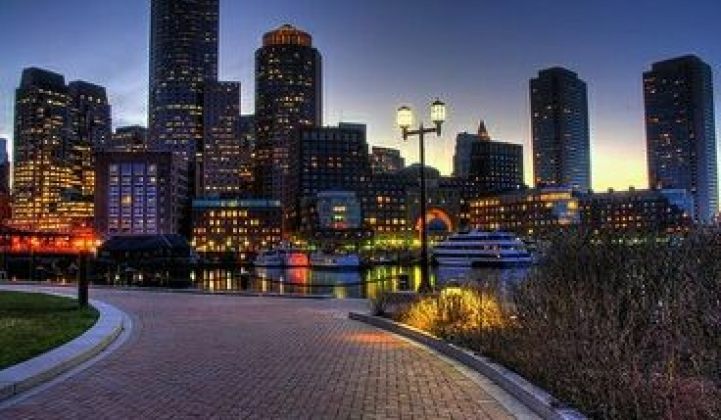 Boston recently passed a city ordinance, along the lines of those passed in San Francisco, New York and six other U.S. cities, that will require every building over 35,000 square feet to disclose its energy use characteristics to the public. This is all in keeping with Boston’s long-range carbon reduction goals, which call for a 25 percent reduction by 2020 and an 80 percent reduction by 2050, as well as incorporating the climate change impacts into all formal planning and project review processes. How Boston manages its electricity bill, which adds up about $55 million a year as of its most recent power procurement contract, is one aspect of curtailing that carbon footprint. On that front, “Our streetlights alone are just under 20 percent of our greenhouse gas emissions as a city,” Swett said, making them a worthy target for efficiency, whether via replacing old lighting fixtures with LEDs or through networking them for more visibility and control. At the executive level, Schneider’s platform will deliver up-to-date citywide energy and greenhouse gas emissions data to a dashboard for Boston Mayor Thomas Menino’s office and other city departments to tap, Wilhite said. Besides electricity and related emissions, Schneider and the city of Boston are looking at tracking fuel consumption and other characteristics for the city’s vehicle fleet. Beyond that, the partners haven’t laid out too many specific goals, Wilhite said -- first, they’ll need to deploy the Resource Advisor platform, which should be installed and running by the end of this year, he added. From there, however, the possibilities could grow. Schneider’s software is “not just an energy platform,” he said. “We have some clients, at the high end, using it to process somewhere upwards of 70 streams of data,” including stats on water, waste and recycling, raw materials and equipment inventories, and the like. That, in turn, can be applied to business processes for sourcing and buying, hedging and risk management, measurement and verification of results, and many other metrics that cities, as well as businesses, could apply to their operations. At some point, the line between a broadly defined “smart city” platform like this and a traditional enterprise resource management software platform begins to blur a bit. Like all of its smart city competitors, Schneider is working with partners as well as its own in-house expertise to expand the range of services and analyses it can offer, Wilhite said. It’s all part of the growing convergence between energy efficiency and enterprise management, one that promises to unlock new value out of the age-old premise of waste not, want not.